Summary: This is an illustrated collection of eight of Jesus’ parables: The House on the Rocks, The Good Samaritan, The Lost Sheep, The Workers in the Vineyard, The Prodigal Son, The Sower and the Seed, The Rich Man’s Feast, and The Unforgiving Servant. The author introduces each story with a question to set the stage: “Do you like building sandcastles?” or “Have you ever lost something precious?” She goes on to tell each parable in short clear sentences, often inserting dialogue when appropriate and emphasizing characters’ joy or indignation or relief. These are characters with whom the reader can identify emotionally. Hoffman then ends each parable with a simple explanation of Jesus’ meaning. Usually, these interpretations come from scripture itself, although sometimes the author inserts her own analysis, suitable to a child’s understanding. Literary elements at work in the story: Parables by their nature are simple tales with few characterizations. Plot drives everything. In this book, as with the original biblical tales, the stories sometimes end with mystifying plot turns, and the reader is left to puzzle out the meaning. Morris’ beautiful paintings expand on the simple plots, showing us the overwhelming joy of the father as he cradles the head of his errant son against his shoulder, or the patient kindness of the Samaritan holding a bleeding stranger on his donkey. How does the perspective on gender/race/culture/economics/ability make a difference to the story? First-centuryPalestine was a patriarchal society, and the author and the illustrator reflect this male-centered social order in both word and picture. All eight of these stories have male protagonists, and only two even show women in subordinate roles in the illustrations. The characters are portrayed as Middle-Eastern in both facial features and clothing. No attempt has been made to modernize the tales at all. Jesus told a lot of stories. I wonder why? How did you feel about the story called “Fair Pay”? If you were the vineyard owner, how would you have paid your workers? Why do think Jesus told the story in the way he did? How would you have reacted if you were the older brother in the story called “The Jealous Brother”? Why do you think that the father was so glad to see his younger son again? The Samaritan in the story called “Neighbors” would have been somebody that none of Jesus’ listeners liked. If we told the story substituting people in our day and time, who would be a good person to play the role of the Samaritan? What can we find out about God by reading the stories of the lost sheep, the prodigal son, and the workers in the vineyard? 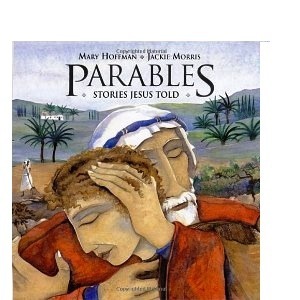 Parables: Stories Jesus Told by Storypath is licensed under a Creative Commons Attribution-NonCommercial 4.0 International License.